Who don’t love the natural nature sound?, all of them love to listen to nature sounds, but what if you need to listen to the nature sound in your room? Do you think it’s not possible? No.. now we can easily listen to the man made or artificial nature sounds online for free of cost and we can also download these sounds for free. You don’t need to pay for listening or downloading to the nature sounds online now. Here is website which is offering “free nature sounds online“. Cool domain name and easy to remember also. If you feel anytime to listen nature sounds just visit naturesoundsfor.me (nature sounds for me) website, you can able to listen lot of cool nature sound. This website contains some relaxing nature sounds so you also visit this website for relaxing purpose by listening different types of nature sounds in one place for free. I have seen some websites are charging for listening or downloading nature sounds, If you don’t won’t to pay and want to enjoy nature sounds online then naturesoundsfor.me is for you only. naturesoundsfor.me is an online web apps to listen nature sounds. It offer free sounds to listen online and also provide an option to download those sounds. With naturesoundsfor.me we can also mix different types of natures sounds and listen all those mixed nature sounds at a time. 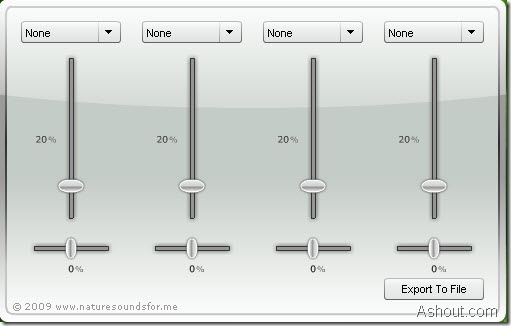 We can also control over the volume level to change the music effect. Four different types of nature sounds can be mixed at a time. Listening Nature Sounds: Listening nature sounds is very easy with naturesoundsfor.me, just select the which nature sounds you like to listen from the drop down menu, that’s it. The selected nature sound will play within few seconds. Downloading Nature Sounds: There is no special download button available in naturesoundsfor.me. To download the listened nature sound, just click the Export To File button to download those nature sounds.